Now you can have everything you’d want outdoors as Kitchen Expressions is proud to offer kitchen design expertise that extends outside your home for all of your backyard entertaining needs. We work exclusively with NatureKast, a brand that is synonymous with beautiful outdoor kitchens. NatureKast has revolutionized the outdoor cabinet industry by offering the first 100% weatherproof cabinet that perfectly replicates the natural color, texture and rich look of real wood without the need for constant maintenance. Imagine a luxurious wood finish that thrives outdoors and won’t warp, fade or crack. Each piece is created using a technologically advanced, high-density resin molding system for cabinet and drawer boxes that are waterproof and the strongest on the market. Full extension stainless steel drawer guides with stainless steel hinges complete the perfect cabinet for any outdoor environment. We also offer many alluring trims, finishes and enticing door styles. 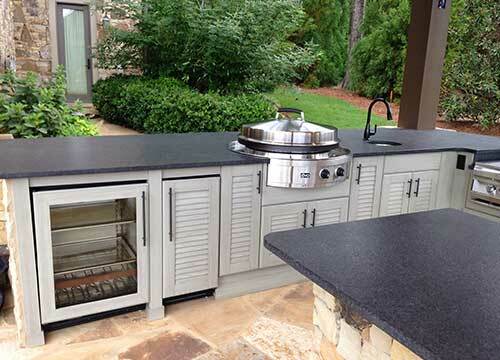 Enjoy unlimited design options for your outdoor kitchen and entertainment area along with the widest range of outdoor TV cabinets, decorative molded elements, and full access appliance cabinets. Everything in NatureKast’s extensive product range coordinates perfectly with Trex decking allowing you to seamlessly upgrade your outdoor kitchen and living space with a completely integrated design. NatureKast, perfecting the art of outdoor living one backyard at a time.